Speaking out • Thirty years ago, LDS leaders drew line in sand against basing the system in Utah. MX missile. 1980 Tribune file photo. The discomfort many politically conservative Mormons feel about their church's push for immigration reform may be a new sensation for this generation. But it's hardly the first time the Salt Lake City-based faith has surprised members by taking a stand opposite of the one they embrace. 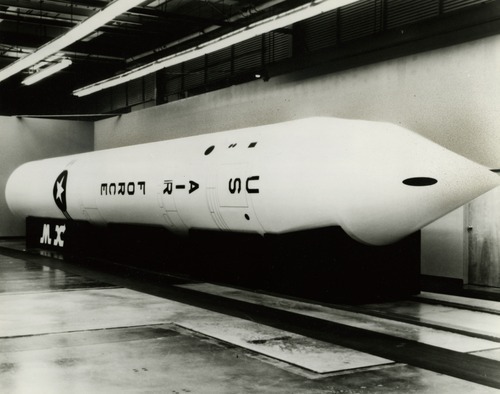 Thirty years ago next week, The Church of Jesus Christ of Latter-day Saints issued a statement rejecting the U.S. Air Force's plan to place MX missiles in 7,000 silos in western Utah and eastern Nevada. "It's not a perfect parallel," says Quin Monson, a political scientist at Brigham Young University. "But it's a good example of a [church] position that took conservatives a bit by surprise." That May 5, 1981, statement was lengthy  710 words  and unequivocal. "Our fathers came to this Western area to establish a base from which to carry the gospel of peace to the peoples of the Earth," the church's governing First Presidency wrote. "It is ironic, and a denial of the very essence of that gospel, that in this same general area there should be constructed a mammoth weapons system potentially capable of destroying much of civilization." Mormons  and the nation  were stunned. Congress already had approved funding and President Jimmy Carter had backed the massive MX project. While President Ronald Reagan had not yet tipped his hand, Utah's entire congressional delegation wanted the MX in Utah and Nevada. Nearly every elected state leader embraced the MX out of patriotic duty or the desire for economic development or both. Even Utah's Democratic governor, Scott M. Matheson, at first embraced the MX, although he and an increasing number of Utahns, influenced by a grass-roots movement, had turned against it by the time the First Presidency issued its statement. According to polls at the time, support among Utahns for the MX deployment in the Great Basin had dropped from 80 percent to less than 50 percent by the spring of 1981. After the First Presidency's statement, 75 percent of Utahns opposed the MX missile coming to the state's backyard. Mormons in Congress quickly reversed their support for bringing the MX to Utah and Nevada. By the end of 1981, the Reagan administration had downscaled the project; only 50 MX missiles ever were built. They were deployed in silos in the Midwest and have since been dismantled. The First Presidency's statement "meant a hell of a lot," says Ed Firmage Sr., then a University of Utah law professor who was active in the anti-MX camp. "It killed it." Firmage had been meeting secretly for months with Gordon B. Hinckley, later the church's president but then a member of the Quorum of the Twelve Apostles, as well as Richard Lindsay, then head of the church's public-affairs committee. Firmage had even met with the First Presidency and the full Quorum of the Twelve to spell out the case against the MX. Firmage covers the subject in a section of his 2003 essay "MX, Democracy, and the Rule of Law," posted on his website, http://tinyurl.com/66rxfum. He credits LDS President Spencer W. Kimball, who had hinted where the church's position was headed in Christmas and Easter messages in the months before the May 5, 1981, statement. Political scientists see evidence that today's Mormons are being influenced by their leaders' statements on immigration. "It's not like everyone is clicking their heels and following along, but there is evidence of responsiveness," says Monson, who polled Mormons before and after the church issued a statement calling for compassion in immigration reform last November. "This issue, just as it splits American society, does so for Mormons," says Matthew Burbank, a political scientist at the University of Utah. "Sure, many are unhappy, but that doesn't mean [they] break all relations with the church." As Monson, the BYU professor, notes: "You're not going to get perfect obedience on gay marriage either. " Steve Hildreth, a BYU graduate and noted national security expert in Washington, D.C. who has written extensively on the MX project and Mormons, says he wouldn't expect those who differ with their church on immigration to change their views. "Utah Mormons are largely dismissive of gospel or official church views on the issues of the day that are at odds with the dominant political ideology in the state," Hildreth writes in an email. "This was true at the time of the MX controversy; it has not changed since." The Utah Campaign to Abolish Nuclear Weapons is planning an "On the Road Again" 5K march and rally Saturday, April 30, to advocate for the Comprehensive Nuclear Test Ban Treaty. The march also will commemorate the successful defeat 30 years ago of the MX missile project, which was slated for the Great Basin. Go to http://utahdatapoints.com for two recent posts from Brigham Young University political scientists who polled Utahns about immigration reform.